I am trying to install Wordpress on Lubuntu. I followed the instructions here. Including PHP Apache and MySQL setups. Apache and MySQL appear to be running fine. Neither /etc/wordpress/config-localhost.php nor /etc/wordpress/config-localhost.php could be found. Ensure one of them exists, is readable by the webserver and contains the right password/username. I have played that guide step by step. And I think in your case something went wrong and the file /etc/wordpress/config-localhost.php actually missing. But this isn't the worst thing. 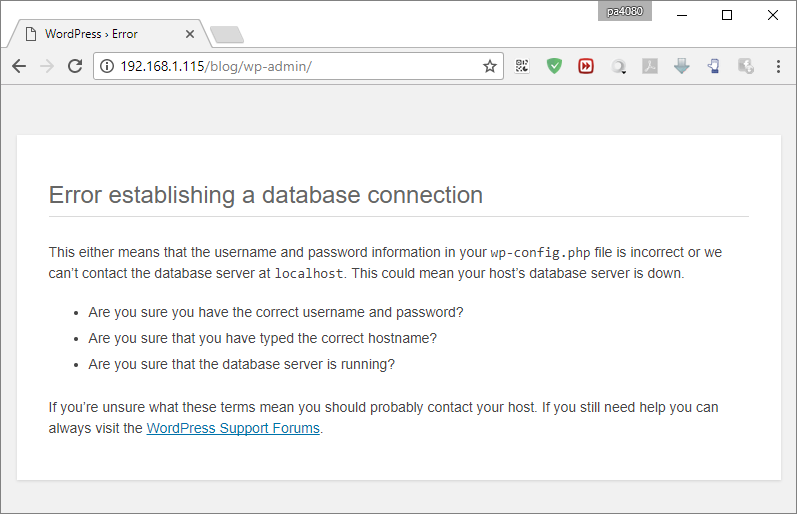 In the manual is missing a step, that describes how to create MySQL database and user for WordPress - the final result. How to do that, under consideration scenario, is described in the article WordPress from the Official Ubuntu Documentation. Another approach is shown under the step 1 below. Linode: How to Install a LAMP Stack on Ubuntu 16.04. Note the Apache's PHP module version depends on your PHP version. Login to the MySQL server from a terminal. Grant all privileges on the Database to the User. Reload the privileges from the grant tables in the mysql database. Where DatabaseName, DatabaseUser and DatabaseUserPassword are subject of your decision. According to the example the User will be allowed to access the Database only from the localhost, this is enough (and safety) when Apache and MySQL servers are allocated on the same 'physical' machine. Don't miss the semicolon (;) at the end of each sentence. Go to the directory where WordPress will be stored. The directory used here is /var/www - this is the default directory where the web content should be stored within nowadays Ubuntu versions. 'UnZip' and 'UnTar' the package, then remove it. Rename the folder. This step is not mandatory. I'm usually using the same name for the installation directory, the name of the data base and the name of the virtual host config file. Also these names are based on the Domain Name if there is dedicated one. WordPress will write some rewrite riles inside, depending on your preferences. For this purpose this file must be writable (or owned) by www-data, also mod_rewrite must be enabled and the usage of the .htaccess file must be allowed by the virtual host configuration - the directive AllowOverride All. Change the WordPress directory ownership. WordPress has mechanisms for auto update and automatic installation of plugins, and I found that, play with permissions and ownership here is complicated task. Into the most manuals as owner of WordPress's content is suggested www-data. Another way to install WordPress is through Ubuntu repositories, like it is described here and here. But (within Ubuntu 16.04) the command apt show wordpress shows that the version into the repo is 4.4.2 while the current version is 4.8.1. Because WP has an mechanism for automatic update it will force you to update this outdated version to the latest one. So you will end up with 4.8, but after few steps of updates where something could go wrong. The main advantage in this approach is that the installation process of WordPress will involve and some dependencies, as these, mentioned at the top of this post. Follow this section if there is dedicated domain or sub-domain name and the WordPress site will be accessible via URL as: http://my-domain.com or http://someprefix.my-domain.com. If you don't intend to run other sites in the near future, just edit 000-default.conf instead of new Virtual Host creation. The first part of the name of the configuration file - wordpress. - is subjects of your decision. # If this is the default configuration file we can use: 'ServerName localhost' or also 'ServerAlias localhost'. Copy the above content and use in nano: Shift+Insert for paste; Ctrl+O and Enter for save; Ctrl+X for exit. Follow this section if there is not dedicated domain or sub-domain name and the WP site will be accessible via URL as: http://my-domain.com/my-blog or http://localhost/my-blog, etc. Within the two mentioned manuals (this and this) WP is appended to all enabled Virtual Hosts. Go to the URL http://someprefix.my-domain.com or http://localhost/my-blog/ in your web browser. The WordPress installer will show up. The data about MySQL data base, created in step 1, must be provided there. Create new Database. You can create and new MySQL User. Download WP in new directory within /var/www. Create new Virtual Host if you using approach 3.A, or, if you using 3.B, setup new Alias path and new <Directory> definitions. Proceed to the web installation of the new WP. Not the answer you're looking for? Browse other questions tagged apache2 mysql php wordpress or ask your own question. How do I setup DVWA on Ubuntu?